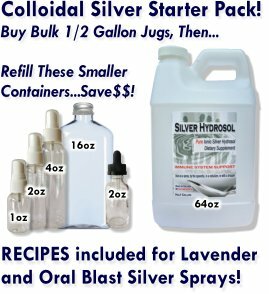 Money Saving Changes To Our Product Lineup PLUS Learn To Make Your Own Colloidal Silver Sprays! Money Saving Changes For You! Plus Make Our Sprays! Our regular customers (THANKS!!) know that our mission is this....truly effective health products that are affordable! 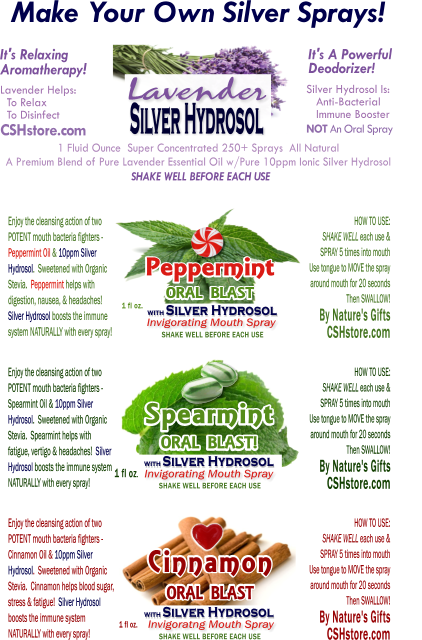 Our product line over a year ago grew to include our wildly popular Lavender Silver Spray and Oral Blast Silver Sprays, however, to continue to grow those products, we were at a crossroads. We were facing the need to invest in a larger facility, automated equipment, etc....., that meant taking on debt, risk, and all the traps that lead to higher costs for us and higher prices for you. Forget it!! We got a better way! What we love to do is sell in bulk. Our Buy 3 Get 1 Free offers on all our products are proof of that fact. Bulk orders mean fewer orders for us to process (lower costs) and allows you to enjoy below wholesale prices, often splitting orders with friends and family....we all win! That's our core model....a way of doing business that is good for you and us! The solution? With every order we now include our simple easy recipes for making our sprays and we offer the spray bottles for sale for a small fee to cover our costs. You not only will save 75% or more on the sprays but if you've been buying smaller pint bottles, you'll see that our half gallon jugs are four times bigger for only double the price! MORE $AVING$!! The essential oils are readily available online or in local stores so please use your favorite brand! We considered selling these oils but saw that it wasn't going to meet our goal of keeping it simple, which means keeping costs down. Reuse these bottles over and over again! We will only be selling our colloidal silver in half gallon jugs and glass pint bottles for those who prefer glass. We also will keep making our healing silver gels and the BreatheEasy Lung Exerciser. Please visit us soon at www.CSHstore.com? We look forward to this new business model and how you enjoy it too! Please email me at CSHstore@mail.com (mail, not gmail) with any questions, ideas, or concerns.